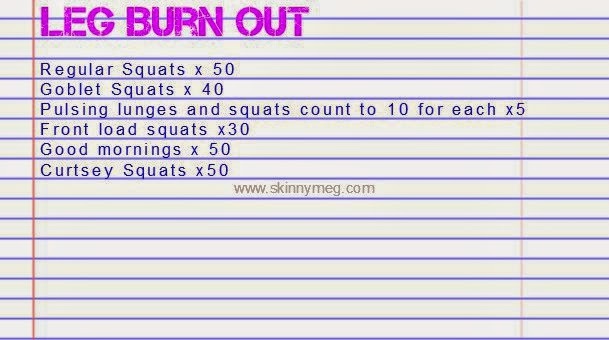 Skinny Meg: Leg Day Burnout! Vacation is quickly approaching, we are headed up north around the end of June to see family and hang out in a cabin by our favorite lake. Oliver doesn't really get the concept of 'summer bodies are made in the winter' he likes to wait until two months out to start gearing up for his swimsuit. Those two months are filled with 'do you think my arms look bigger?' , 'you don't think one beer will hurt me, right? ', and constant complaining that he's not losing weight after two days of eating right. hahahha. I do love when I get text messages that say 'ran two miles with binks this morning. Was tough, but we got through it together!' and a sweaty selfie to prove it, all the heart eye emoji's!!! No secret that I'm all about a good leg day heavy days, lighter days, honestly I don't care as long as they are shaking when I'm done! I put together some basic leg movements that you can change up to make harder just by increasing your weight. You decided how beastmode you wanna be today and let me know, mmmmkay? Getting your squat form right is hard, real hard! I highly suggest you squat by a mirror and/or video yourself so you can look at it and see maybe what you're doing wrong. Practice makes perfect and the stronger you get the better your form will become, promise. Don't add weight at the sake of form, you can always build that up once you have a good base. Hi Meg!! Following along with the video.. am I missing the Good Mornings or are the not shown?! Can you tell me what you are taking to make your hair grow? I know you posted it sometime this winter/spring but I cannot for the love find that post back. I use the hair skin and nails supplement from It Works! Feel free to never come back :) I won't be hurt, swear. Some of us people appreciate Meg's efforts and open and honesty. She has lots of great ideas and shows herself actually doing what she writes about and/or is vocal about. I would be glad for you to get your leg advice from someone else as well. How incredibly rude! Didn't your mother teach you to keep your mouth shut, if you don't have anything nice to say? Meg, please ignore her! You rock! I love you so much and she is just another troll! Love love love your workout wednesdays! I'm in your group and mentioned in a squat post how they all looked the same but different weights. I didn't understand until yesterday when I tried it. WOWZA! Placing the weight in different spots really makes a difference. Feel the burn! LOVE IT!!! You rock! LOVE your blog Meg!! Question-- how do you prevent or lessen DOMS/post-workout soreness?? I cannot bear to work out again when I'm so sore! And I don't want to wait a week to workout again! Do you still recommend the Nike Free Bionic, or do you only use those for leg days? I am researching for some new ones for all crosstraining and cardio on the dreadmill! I am sure amazon and zappos could offer review, but as a reader, I value your opinion! Do yo do 50 on each leg for the curtsey squats, or 25 each for 50 total? Are you sponsoring a diet bet soon? Tips for losing weight with food. Things I ate this Weekend. Babies are good for your body! Pulled over for Running too Fast. Co-parenting with my six year old. So Cute, so Creepy, so Fabulous.